Stop everything you are doing and watch this video from littleBits about the Droid Inventor Kit. I have not played with this kit and only found out about it 30 minutes ago, but this video really got to me for some reason. The music, the feeling that there was something special going on and the young girl was on an adventure to see what it was about, and the community of inventors working together to create these droids was just very cool to me. It just felt awesome to see. My new role as a Makerspace Director has me thinking about what I'm trying to accomplish and the atmosphere in the room at the end is what I want to see in the Makerspace. Lots of movement and collaboration. Lots of support and smiles. I've been drawn to littleBits over the past few years because they are committed to supporting young inventors. They want everyone to have an opportunity to make and break. I love that mission and it makes me smile when I can see parts of my childhood be reborn like littleBits has done. I will be waking up early to make sure I can order my own kit or two when they are available. I wasn't sure if I was going to weigh in on this topic, but I figured I would because that is why I have a blog and Twitter account. To be honest, I'm actually pretty tired of seeing the HW debate bounce around the Twitter feed and the stances that people take. Maybe I'm not so tired of the HW debate, but the stances. Very few things in education are all or nothing. Education is nuanced. You cannot just say all homework is bad and teachers are bad because they assign homework that takes students away from valuable family time. Ugh. As a HS English teacher, I assigned reading almost every single day. No more than 20 pages per night. The reading has to get done outside of the classroom because there is no way possible for a HS English teacher to cover 3 novels, 2 plays, and numerous short stories and poems in 180 days of school. It could be possible if all students did in class was show up and read with no discussion or assessment, then maybe there is enough time. I still gave students in class reading time for novels we were reading because they do have busy schedules and I try to be understanding, but students will have to read at home. That is work that is done at home. Homework. I have yet to find an instructional strategy that allowed all of the curriculum to be covered while not allowing students the time to read at home. There is bad homework though. Work that is designed to keep students busy and they have to finish it at home. That is busy work. Word searches and crossword puzzles are the worst. In my view, most worksheets are awful and need to go away, but I do not teach all grade levels in all areas, so I could be wrong in some instances. The problem with all homework is bad is that it is a very final statement. Twitter is not a very good place to have a HW debate because you are very limited in what you can say and education, as I said earlier, is too nuanced to be addressed in 140 characters. As the school year starts, I recommend all teachers to take a look at the assignments they intend to give this year and see if it is something that students need to do. Take notes on what students are doing at home and revisit the the assignments at the end of the year to see if they need to stay or go. The final verdict from me is that there is good homework and bad homework. If we spend more time helping teachers get the most out of their instructional time, this will limit the need for homework. If something needs to go home, teachers should be supported in creating the best possible homework so students can get the most out of that take home educational experience. Please leave your thoughts in the comments below to continue the conversation. A Makerspace is NEVER driven by stuff. A Makerspace is ALWAYS driven by people. The people that are part of the Makerspace community should decide what is in there based on their interests. If you are an educator looking to stock a Makerspace, I hope you have talked to your students first and asked them what they are interested in making. That should be what guides you in making your purchases. You have a chance to get a copy of my book and a Hue Animation Studio kit! All you have to do is tweet a picture of something you've made to @TheNerdyTeacher and @HueHD with the tag #MakerMonday by Sunday August 27th for a chance to win. The winner will be chosen at random. If you have any questions, please tweet @TheNerdyTeacher. Thanks and good luck! What is HUE Animation Studio? "HUE Animation Studio is a complete stop motion animation kit which includes the HUE HD camera, a single license for HUE Animation and the HUE Book of Animation"
Are you truly Making if you are just following directions? My answer to that is yes. A big, fat yes for that matter. I love starting my learning with kits. If I want to tackle something completely new and have no idea where to start, I will order a kit so I can get my bearings. After going through the motions with the kit and understanding what everything can do, I start to branch out and explore my ideas based on what I've learned. That is the beauty of kits. They are the gateway to more in-depth making. I get very frustrated that there is a "my way or the highway" approach to Making and Makerspaces. Not everyone is going to follow the same path when it comes to Making and that should be embraced and supported by all educators. Our students are not starting in the same place, so why not offer them a kit or challenge to help guide them on their journey. I think it is called differentiation. Companies (littleBits, SparkFun, Pimoroni, PiSupply, etc.) offer a simple access point to complex electronics that might be too intimidating for beginners to explore on their own. I appreciate any company that wants to try and make STEAM concepts more accessible to a variety of learners. Can these kits be pricey? Yes, but getting all of the pieces for various projects and creating the guides for them are not cheap and a person is paying for the convenience the kit provides. As a Maker community, please let us be kind and supportive of all learners, adult and child, that are trying to explore the creative world around them in ways that work for them. Wrong kit. This is K.I.T.T. From that moment, I was hooked. I had the itch to keep learning and to dive deeper because of that experience. I am not sure if the blinking LED was supposed to be the skill that hooks a Maker, but it hooked me. I think this needs to be kept in mind for teachers out there. We want our students to explore the world around them to see what they can learn and love. We do not have any idea what will be the lesson, book, comment, or idea that will set them off on a journey of discovery, but we need to make sure we give all of our students an opportunity. As the school year starts, there will be plenty of time to focus on the curriculum that needs to be covered. I hope as educators, we think about the experiences we want to create for our students. Those are the things that can alter their trajectory for the rest of their life. For me, Picademy launched me into the world of Raspberry Pi and Making that has led me to great learning and sharing with a passionate community. That has allowed me to connect with my students and pass the awesomeness to them. Life is made up of experiences and school should be designed to give students the best learning experiences possible. What experiences do you want your students to have this year? I was out back and I was looking at my pond like I usually do most Summer days. 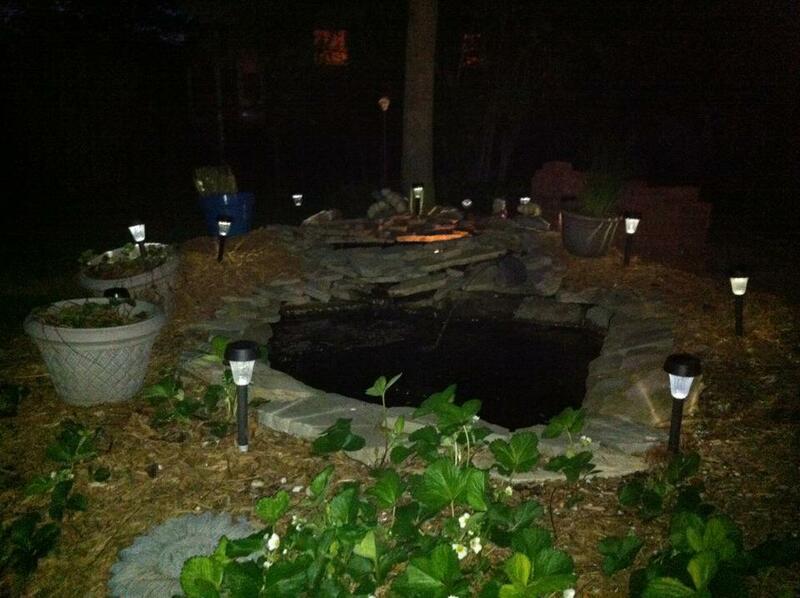 Here is a shot of my pond. I built it all by myself. One of my earliest adult Maker projects. As I walked by and noticed how clear my water had become since changing filters, I thought it would be cool if I could see where my fish like to hide. I broke a few large Terra Cotta pots in half and placed them in the pond to create little caves for the fish to hide from raccoons and a white crane that hangs in the backyard. I immediately that that a my Raspberry Pi Zero W attached to my Dremel 3D printer would be perfect for this project. Here is a link to elinux.org site that walked me through the code to create a Web Interface for my Raspberry Pi Camera. Since I had the program up and running already, I needed to come up with a to power the Pi and to keep it dry. After a quick run to the store for some Diver grade waterproof bags and battery pack, I was ready to put together my underwater Pi. These are some photos of the camera in the bag with the battery pack. I also added this little LED light. I think it helped a bit. Here is the bag floating on the surface of the pond getting some great shots of the fish swimming around. If I wanted, I could weigh the bag to the bottom of the pond (3.5 ft), but I'm not sure the wifi signal would be that strong. This entire project was easy because I had a Pi set up for video and timelapse. I just needed to take it and make it waterproof. This was a fun project that I can really explore more deeply by thinking about building a motorized boat around the floating bag that would allow me to steer it around the pond to specific areas and get really tight shots.